The season of love is just around the corner, but there are many ways to celebrate this season, other than by buying flowers and doing romantic things for your significant other – it could also be a season to celebrate familial love! One such way is to enhance the cosiness of your home by giving it a makeover. 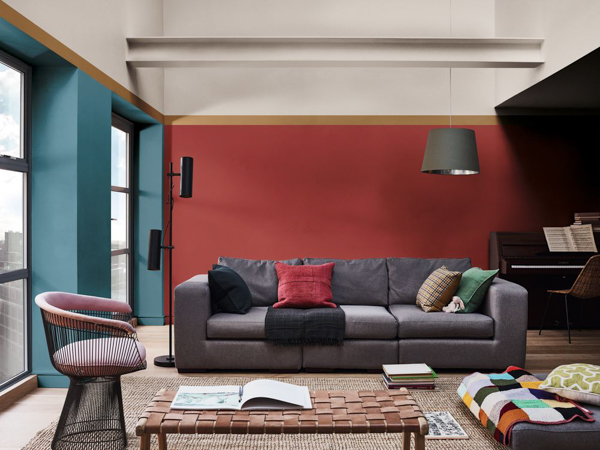 Spiced Honey, also known as Crème Brulee (00YY 26/220), is the 2019 Colour of the Year by Dulux. With warm amber tones that is inspired by the beauty and versatility of honey, this colour adds a sense of calmness and cosiness to a room – perfect for those looking for a place that’s comfortable for the whole family. Apart from the bedroom, you’d most likely be spending some time in the living room as well – all the more reason to give it a makeover! Pictured here is the combination of four different colours, each serving a different purpose. The teal on the left adds some intensity and can draw attention to particular location, while the terracotta red behind the sofa adds warmth. Lastly, the golden-toned stripe at the top gives a hint of luxury. When it’s time to answer the Sandman’s call, surround yourselves with an intensely warm and welcoming atmosphere! If you love the way this bedroom looks, then you’ll want to blend warm orange with Spiced Honey for the walls, and a little bit of white for the ceilings for some contrast. Finish the look by adding simple wooden furniture and fabrics that are rich in patterns. With that, even when you and your family sleep, things are kept cosy and warm. Last but not least, we take a look at how we can spice things up in the kitchen and dining room, because a family that eats together, stays together. In this picture, we went with a deeper shade of teal for the main wall, and added a little bit of forest green as well as Spiced Honey. 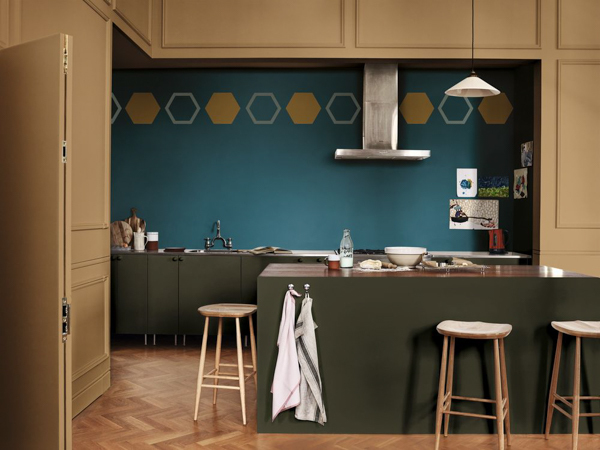 If you’d like to add some sophistication into the mix, you could paint some honeycomb-inspired shapes on the walls. For those who prefer uniformity, you could also opt for a palette that’s similar to the bedroom and living room featured above. 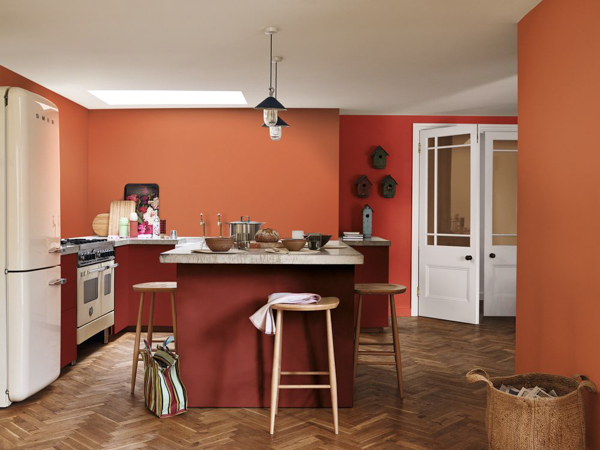 This look uses warm orange as the main colour, and is complemented by terracotta red and Spiced Honey. Bold and warm, this look is sure to encourage spicy conversations. Again, wooden furniture help to tie everything together. Regardless of which colours you decide to go with, there are plenty of colour options and ideas for you to consider painting your home with this Valentine’s Day. All you have to do is point your browser to www.dulux.com.my.